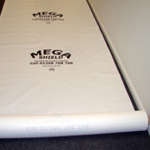 MegaShield™ is a unique floor protection film which is very popular within many industries including ship repair, hotel, office and shop fit-out companies and more. Supplied on the roll, this product is layed on top of the floor and can be taped (which we sell) into place if required. MegaShield™ is re-useable and water-proof. With a unique embossed texture which has very good anti-slip qualities, making it safe to work on. MegaShield is Flame Retardant to LPS1207 LPCB certification making it the UK's number 1 choice for builders as it completely conforms with current building regulations.